There are a limitless number of reasons that people find certain lighting appealing. A warm tone may subconsciously remind you of the light given off by a lamp in your grandmothers house. Or a cool light blue may be a breath of fresh air to you, relaxing and refreshing like rain on the open sea. Or maybe none of those things at all! Preference is not static, it’s fluid. It changes with your mood, and grows as you do, with every new experience. So, how do we decide which lights to make permanent? With fluorescent lighting fixtures (the most common lighting), most people think they have to change the entire fixture to improve the lighting in the space. 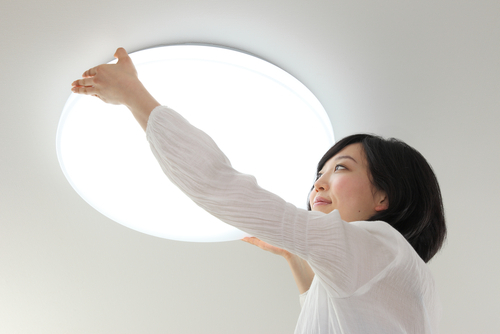 Replacement light lenses can improve a space along with a simple change of the bulb. Light filters need replacing after a while, although they may not be broken. If your workday is negatively effected by the glare or headaches you get from the lighting, changing the lens out will save you the trouble of buying a new fixture. Not all fixtures are shaped to fit the standard sized lenses. So you may need to order the lens you need in a custom size. If your tired of buying fluorescent bulbs for your fixtures and being disappointed, you may want to try LED bulbs. They are a bit pricier, but they can save 30% more energy and have a longer life time. They make LED tubes to fit standard light fixtures – the same size as the fluorescent tubes. LED’s will dramatically change the lighting in a space. A pro tip is to use LED’s in a space where you need a concentration of light, and less distribution. We have another discussion you may find helpful, on how lighting changes moods. Check out our Pinterest for Lighting How-To’s and more! Why is Hospital Lighting Always Terrible? Find Out Here.